St Joaquina was born into a noble family at Barcelona, Spain. She married a lawyer and landowner and they had nine children. Around the time of her husband’s death, she moved to their family estate in Vic and, using her family wealth, started tending to the local sick and poor. 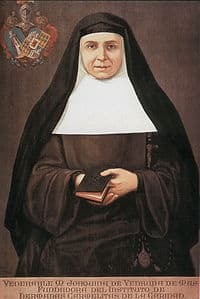 Encouraged by others including, the Bishop of Vic, she established a community of Carmelite women devoted to education and charity. Despite many difficulties and the interruption of wars, St Joaquina’s congregation spread throughout Spain and America. In her later years, St Joaquina resigned as Superior of her Order due to ill health which left her paralysed. She died aged 71. She is widely remembered for her many good works of charity, devotion to the “Trust in God” and her miracles. St Joaquina’s resting place (incorrupt body) is at her Charities Mother-house in Vic. Her Feast Day is the 28th August. She is the Patron Saint of abuse victims, exiles, widows, mothers and the Carmelite Sisters of Charity. Pray for us that we will forever remember the plight of the poor in our daily prayers and actions.